Educated, Experienced & Excited About What We Do! That is an interesting question and a great picture. If you hike through the woods, you will often encounter similar looking trees. While I can't be certain without inspecting the tree, it certainly looks like classic lightning strike damage. Because trees are often the highest object in a given area and lightning seeks the path of least resistance to ground, trees often become lightning rods. Varying degrees of damage can occur to the tree depending on the specific tree and weather conditions. If the bark of a tree is wet with rain, and if the tree has a smooth bark like a beech tree, lightning may travel down the outside of the bark without any or much apparent damage. If the tree has high resin content like a pine, a lightning strike may cause the tree to explode because of the intense heat generated inside the tree. The wettest part of the tree and an often observed situation is shown in your picture. The tree's cambium (the outside layer under the bark) contains water and nutrients and is a good pathway for lightning to ground. 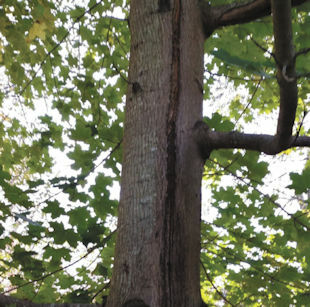 When lightning goes through that path, the water and sap become superheated and explode the bark off the tree generally in a small channel cut down the tree (as shown in your picture). If the cambium layer gets cut all around the tree, the tree will die. That doesn't seem to be the case looking at your picture, where the damage appears to be up and down. Evidence of the tree heeling the wound can also be seen in your picture. What is more uncertain is damage to the root system that is hidden from view. Sometimes it will be very obvious because you'll see cracks in the soil and wilted plants surrounding the tree; other times you'll notice nothing at all. It is safe to say the tree that is struck by lightning is extremely stressed and needs all the nutrients it can get. Water it frequently especially during dry spells to help it's uptake of nutrients from the soil. Deep root fertilization can also help and that's a service Sprigs & Twigs can provide. It is a good sign that you are not noticing any adverse effects so far with no dying branches. The scar on the tree is permanent however. Do not put any paint or covering on the scar because it will encourage insect damage. We would be happy to come over and inspect the tree more closely, give us a call. To view a PDF of this article, please click here. Linda K. Lillie is the President of Sprigs & Twigs, Inc, the premier landscape design and maintenance, tree care, lawn care, stonework, and carpentry service provider in southeastern Connecticut since 1997. She is a graduate of Connecticut College in Botany, a Connecticut Master Gardener and a national award winning landscape designer for her landscape design and landscape installation work. Enter a search term above, or select a category below to browse the available articles. Our weekly "Ask The Landscape Professional" series is expanding to include video lectures on various topics. To watch some of our lectures online, please click here. Do you have a question to Ask The Landscape Professional? Click here to contact us and send us your question!